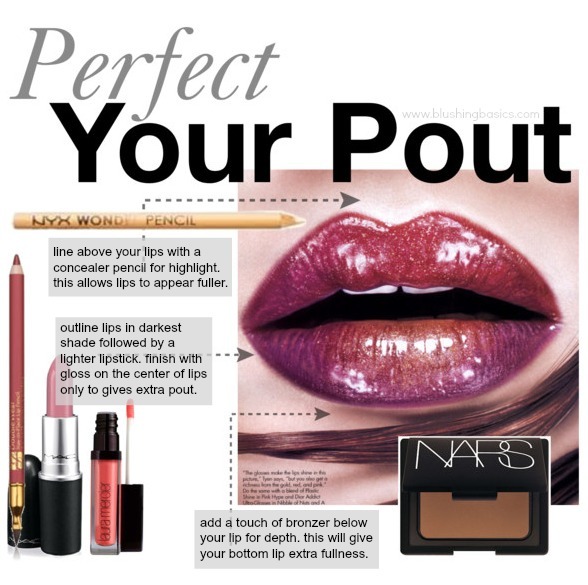 perfecting your pout (aka lipstick) is more than just picking the perfect color. have perfectly luscious lips - even when they are pencil thin like mine - is completely attainable. sure it involves a few more steps than your typical swipe of lipgloss but believe me, your instagram/husband/boyfriend/SO/pictures will thank me. so how do you take drab lips to fab lips? it begins with a good concealer pencil. my favorite is the NYX Wonder Pencil - a really inexpensive product that works amazingly well. can i tell you how ridiculously excited NYX is beginning to be sold in Target?! my two favorite things in one place! adding a concealer pencil above your natural lip-line will highlight the area, making it appear slightly raised which gives the appearance of a fuller top lip. second is your typical lip pencil/lipstick/gloss trio. everybody does it, but make sure you take these steps when doing it. first, apply a lip liner that is darker than your lip color making sure to fill in the outer corners of your lips. you want the darker color to be on the outside and the lightest color on the inside. this too gives the illusion of fullness. fill in the center of your lips with your lip color and apply your gloss only to the center of your lips as well. last you want to make sure you finish with a bronzer. adding a touch of bronzer below your bottom lip will make it appear poutier and fuller. a small step that goes a long way. you are now on your way to fuller, poutier lips.